« Colorful Fox Squirrels–Were they the More Common Squirrel in the Southeast During the Pleistocene? The Devil’s Den fossil site is located near Williston, Florida in Levy County. It’s a sinkhole that served as a natural trap between 9,000 BP and 8,000 BP. Apparently, the sinkhole closed until a few hundred years ago when it reopened and began trapping animals again. The sinkhole ranges between 5-90 feet below the average water table and accordingly is filled with water. It also serves as a bat roosting site, explaining the numerous chiropteran remains. Rainwater dissolving limestone bedrock creates sinkholes such as this one. Location of Levy County (red), site of the Devil’s Den sinkhole. The area immediately adjacent to the sinkhole originally consisted of a dense mesic forest of hardwood, but beyond this moist environment, a grassland savannah with widely spaced live oaks predominated. Scientists believe this was also the type of environment that occurred here 9,000 years ago at the time of the fossil depositions. Indians later periodically cultivated some of the land. Though watermelons didn’t originate in North America, Indians in Florida grew large quantities of them from seeds they obtained from Europeans. The earliest recorded use of the land around Devil’s Den was as a watermelon field. The next owner used the sinkhole as a garbage dump. By the time scientists were granted permission to excavate fossils here in the late 1960’s, it was in the middle of a cow pasture. Today, it is a private resort and a destination for scuba divers and campers. There are 4 chambers in the sinkhole that scuba divers enjoy exploring. The excavated fossils came from chamber #3, but scuba divers report seeing fossils all over the bottom still. H.K. Brooks’ study was in 1974 before radiocarbon dating was recalibrated. This means the dates of the fossils at Devil’s Den probably are from 8,000 BP-9,000 BP rather than 8000 BP-7,000 BP, but this is still 3,000 years younger than the commonly accepted terminal extinction dates of most megafauna species. The Devil’s Den sinkhole. Imagine a deer being chased by a dire wolf and falling in this hole. If a person could go back in time and camp at this site 9,000 years BP, they would find a wilderness rich in wildlife. Several species of megafauna may have already become extinct while others were in decline, yet they still existed. Bison, horses, and flat-headed peccaries roamed the savannahs and rested in the shade of centuries-old live oaks. Great droves of white-tail deer outnumbered all the other ungulates because they were better able to withstand human hunting pressure. White-tail deer fossils were by far the most common of the ungulates at this locality. This is unusual compared to other Pleistocene fossil sites in Florida. Dr. Webb suggests competing tapirs, llamas, and long-nosed peccaries had become extinct by this time. All of these species favored forest or forest edge habitat. Without them deer had this niche to themselves. Mastodons and Jefferson’s ground sloths browsed the moist woods. A camper going on a hike would need to carry a firearm. Saber-tooths, jaguars, and dire wolves still stalked the range. Two species of bears might prove troublesome too, but by this time they probably had learned to fear man. Paleo-indians and their dogs occasionally passed through here as well. But the most common carnivore was the striped skunk. Scientists found 36 striped skunk skulls at Devil’s Den. Either they were abundant, or they had a knack for falling into sinkholes. The same might be true for cottontail rabbits which left more fossils at Devil’s Den than any other animal. Below is a list of mammal species recovered from the Devil’s Den fossil site. * denotes extinct species. In addition cows and pigs from more recent times had fallen in the sinkhole and they left bones. Although a study of bird fossils from Devil’s Den was conducted, the results were never published. J. Alan Holman did publish his study of reptile and amphibian fossils from Devil’s Den in Herpetologica 34 (2) in 1978. The abstract of that paper claims 1 salamander, 5 species of frogs, alligators, 1 species of lizard, and 15 species of snakes were recovered here. Devil’s Den is also the youngest known record of both species of extinct giant tortoise–Hespertestudo crassicutata and Hesperotestudo incisa. Interestingly, in addition to discussing the site and the fossils, Dr. Webb came up with a long convoluted statistical analysis that allegedly showed how the evidence from Devil’s Den supported climate change as a cause of megafauna extinction. His analysis came to the conclusion that the mass wave of extinction at the end of the Wisconsinian Ice Age was not unusual–a ludicrous claim. Dr. Webb is retired now, but in his later work he did come to accept that man played an important role in the extinction of at least some of the megafauna. This entry was posted on July 8, 2012 at 3:29 pm and is filed under Fossil Sites, Uncategorized. You can follow any responses to this entry through the RSS 2.0 feed. You can leave a response, or trackback from your own site. Another great essay. One quibble–from what I understand, Devil’s Den remains in private hands and is not state-owned. I’m sure it’s high on the list of turning it over to public property and state park status, but I’m almost positive it remains in private hands. It kind of makes sense that megafauna would have hung on here a bit longer if the march of human across the continent began in the northwest. It would seem logical that they’d reach the southeast corner of North America last (in numbers large enough to cause extinctions). And I remain convinced that all of the Pleistocene megafauna extinctions in North America, South America, Asia, and Australia were human-caused and not at all connected to climate change. I also see that a private business seems to be profiting from the site. Maybe it’s some kind of quasi-public/private deal. Paleo-indians occupied Florida as early as 14,000 BP. They passed through the continent to get to Florida, but most archaeologists think Indians that settled in Florida later spread throughout the rest of North America. Yes they are two different sites. I recently visited Devil’s Den in Williston, Florida. 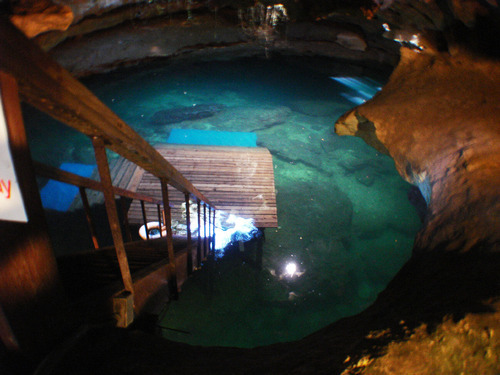 It consists of an underwater cave exposed by a sinkhole. It is a spectacular place to see and appears to have an abundance of fossils that have been discovered. It is still privately owned. Devil’s Den is a place everyone should visit! There’s no spring or diving at that location, although I have been told that it was once rich in fossils. Oh that explains the discrepency. There are 2 places with similar names in north Florida. I’m going to edit in the correction. Thanks.